TACLOBAN CITY – In his strongest words to date on erring public officials, Interior and Local Government Secretary Jesse M. Robredo on Monday cautioned local government officials on absenteeism and dereliction of duty. “A local government official could be suspended or removed from office for dishonesty, oppression, misconduct in office, gross negligence or dereliction of duty, or unauthorized absence for 15 consecutive working days,” he said, reiterating Section 60 of the Local Government Code. “Some local government officials are either frequently absent or holding office elsewhere, other than their official places of assignment,” he said. The warning was directed to all governors, mayors, vice governors, vice mayors, local legislators, and barangay officials nationwide. “In the case of sanggunian members, disorderly behavior and absences for four consecutive sessions without justifiable cause, subject sanggunian member may be censured, reprimanded, excluded from the session, or suspended for not more than 60 days, or expelled,” explained Robredo. 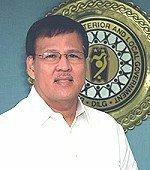 The DILG secretary enjoined all local government officials to hold office at the established seat of government – the provincial capitol, city hall or municipal hall. He said local government officials should render full time service and devote time and attention to the performance of their official duties and should refrain from practicing professions, or engaging in any occupation other than the exercise of their functions. CEBU CITY – Greenpeace today called on the Philippine Government to make way for progress unlimited by dirty energy by phasing out coal-fired power plants and cancelling all new build of coal as a key step to ensure the massive uptake of renewable energy in the country. The environment group is challenging the current administration to source half of the country’s energy needs from renewable energy by 2020. The call came during a Renewable Energy Summit in Cebu City this week which aims to develop a renewable energy plan for the Visayas. “In the Philippines, the Visayas is the most well-suited to become the model for decentralized renewable energy ‘smart’ grids of the future. But the biggest challenge to renewable energy development is coal. Every coal-fired power plant approved and built here is a step backwards to the dark and dirty power plants of the past,” said Mark Dia, Country Representative of Greenpeace Southeast Asia. “Local and national governments must realize that coal is a problem. Renewable energy is the solution. If we are to meet the challenges of sustainable energy development in Central Visayas and the whole country, public and private sectors must move to block coal development with the same drive and strength with which they promote renewable energy. We need forward-looking plans, otherwise we will continue to be stuck with outdated technologies that are hostage to the market prices of limited and finite fuels,” he added. The provinces of Western Visayas are among those which have readily embraced renewable energy over coal power generation. Negros Occidental is the first Philippine province to declare a 100% renewable energy target while Antique is one of the first provinces to declare itself a coal-power free zone. In the Visayas, renewable energy, such as that from solar, wind, geothermal, run-of-river hydro and biomass, is abundant, available, and ready to be deployed. In Cebu alone, two new coal-fired power plant developments continue to be built, despite massive community protest: 264 megawatts in Toledo and 200MW in Naga towns. Coal is the dirtiest fossil fuel and its combustion for energy and the resulting toxic coal ash causes sickness and death, destroys livelihoods, and is one of the leading causes of climate change. "In Iloilo, the entry of coal has now limited the space to be able to stimulate the development of renewable energy sources not only in the City but the rest of Panay. Despite very strong opposition from the public, the project went ahead. Even before the coal plant has operated, we have to deal with damaged roads, increased problems with dust, particulates and noise pollution. During the test phase, there were reported health problems in the surrounding communities. We are now concerned what will happen when this coal plant fully operates," said Dr Jose Ali Bedano from the Foundation of the Philippine Environments Regional Advisory Council in the Visayas. "In Cebu, coal plants are creating problems – they are contaminating water, killing marine ecosystems, and making host communities sick. These externalities are not factored into the price of coal. Incorporate these and this will show the true cost, that coal very expensive. This is the same flawed energy development pathway that coal and their fossil-fuel apologists are trying to replicate nationwide such as in Davao," said Vince Cinches from the Fisherfolk Development Center in Cebu, one of the lead organizers of the Renewable Energy Summit. Greenpeace is advocating an “Energy Revolution” (ER), a transformation in the way energy is used, produced and distributed as a key solution to mitigate climate change. This entails a massive shift to renewable energy and energy efficiency technologies. Greenpeace believes that the target of 50% renewable energy in the country’s energy mix by 2020 is not only achievable but is imperative for energy security and sustainable economic growth. All that is needed is the political will to transform vision into reality. Greenpeace is an independent global campaigning organization that acts to change attitudes and behavior to protect and conserve the environment and to promote peace. Women to House members: stop maternal deaths, pass RH Bill now! QUEZON CITY – Unmindful of the scorching sun and smog, groups of women from grassroots communities joined the long march of more than 6,000 women and male allies as they called on the members of the House of Representatives to stop delaying the passage of the much clamored reproductive health bill. Each day of delay, the lives of eleven women are wasted due to lack of access to comprehensive reproductive health education and services, laments Elizabeth Angsioco, DSWP National Chairperson. “March 8 is supposed to be a day for women to celebrate but such celebration is meaningless knowing that each day, eleven Filipino women, mostly poor, die due to pregnancy and childbirth complications. Moreover, the bill that can help arrest this massacre of women is held hostage by some legislators who resort to all kinds of delaying tactics to block the RH bill’s passage,” expressed Angsioco. According to her, DSWP members are dismayed by the fact that some members of the House of Representatives would set aside their mandate and instead become instruments of the Catholic hierarchy in blocking the bill. It is disgusting that some lawmakers resort to all types of antics - from being absent from sessions so there will be no quorum, to filibustering, even expressing needless complaints during plenary to eat up time, Angsioco said. Angsioco laments that RH bill has been languishing in the Halls of Congress for more 16 years now. “So many lives have been wasted. The Catholic church will never change their opposition on the use of contraceptives, but they are not the ones directly affected by the issue, it is the women, especially poor women,” she said. “Again, as we commemorate women’s day, we demand accountability from our lawmakers. Your mandate is to serve the people – us, NOT the Catholic hierarchy. Your responsibility is to see to it that bills are properly processed, not blocked. You must see the legislative process through. The RH bill should be voted on. This is all we ask. If you have the numbers, you should not delay,” Angsioco emphasized. Almost all sectors – government agencies, academe, business, youth, interfaith organizations, media, medical organizations, civil society and community organizations are supportive of the bill, shared Angsioco. The big majority of Filipino people want the RH bill to pass. “Arguments on the issue have been exhausted. There is nothing new to add. There is no need for further delay. Stop maternal deaths. The immediate passage of the RH bill is the single most important legacy this Congress can give Filipino women. Pass the RH bill now!” she ended. TACLOBAN CITY – The Department of Environment and Natural Resources (DENR-8) is set to sign an agreement with three industries for the clean-up of two major creeks in the city of Tacloban under the Adopt-A-Estero Program – a priority program of the DENR under the leadership of Sec. Ramon Paje. The industries are Coca Cola Bottlers Phils. (CCBPI) - Tacloban Branch, Shell and Petron. These three industries have been diversifying its corporate social responsibility and helping in the drive to clean up the waterways is now among them. The signing ceremony between DENR and the CCBPI, which is slated this March 19 in Burayan, San Jose, Tacloban, is seen to formalize and solidify the partnership for the program that is aimed to address the huge volume of silt, wastes and other debris that have long accumulated in these two waterways. Coca Cola, Shell and Petron will also be involved in the information and education campaign, community mobilization, and training of community leaders on solid waste management. Under the MOA to be signed, part of their responsibility is to prepare a comprehensive Clean-Up plan and provide the resources in accomplishing this plan. They will also have to undertake expanded environmental improvement, including the dredging of some portions of their respective adopted esteros. For its part, DENR, through EMB will intensify monitoring of industrial and commercial establishments and undertake, among others, regular water quality monitoring of selected areas within the Mangonbangon River, Burayan River and Mahayahay Creeks. EMB will also provide the necessary technical assistance to stakeholders as well as facilitate actions against violators as provided for in Republic Acts 9003 (Ecological Solid Waste Management Act) and 9275 (Clean Water Act). TACLOBAN CITY – February 2011 saw the massive military operations conducted by the 14th Infantry Battalion in Giporlos, Eastern Samar. Last February 10, 2011 the Regional Alliance was able to document a case of threat/harassment/interrogation and divestment of property against two children. These two children, aged 17 years old, were on their way to get their copra from their farm when a group of operating soldiers from the Bravo Company of the 14th IB passed by. These two children were interrogated and questioned on the whereabouts of the New People’s Army (NPA). Before the soldiers left, the “sundang” of these children were taken by the soldiers, their pictures were taken and they were threatened not to tell anyone especially the Barangay Officials of Brgy. Huknan, or else “they will be abducted”. Out of fear, the children hurriedly went home. “This case is a clear indicator that the Armed Forces of the Philippines (AFP) never respect the rights of children. International and local laws and statutes give special protection to children and they are considered as “zones of peace’ and they should be given high respect at all times” said Kathrina R. Castillo, Head of the Documentation Committee of KATUNGOD-SB-KARAPATAN. “The Regional Alliance had documented many cases such as these and it is alarming. This case reveals the true face of IPSP Bayanihan, the new counter-insurgency program of the US-Aquino III Regime. From the words of the document it gives emphasis on respect for human rights but as they say, “you cannot teach old dog new tricks”, the practice of the military of violating the human rights of the people especially the children continue” added Castillo. “We are calling on all peace loving people who are concerned with our youth to join us in condemning this act of the military who are violating the rights of our children in Eastern Visayas. We must be vigilant and we must be active in protecting the rights of the children. If the children of Eastern Visayas will be threatened and interrogated, the way these soldiers threaten and interrogated the children from Brgy. Huknan, what future can we expect for Eastern Visayas?” ends Castillo. MALACAÑANG, Manila – THE Aquino Administration has ratified and endorsed the Rome Statute of the International Criminal Court (ICC), sending a message to the international community that it is committed to upholding and protecting human rights. Executive Secretary Paquito N. Ochoa Jr. said on Sunday that President Aquino III signed on February 28 the Instrument of Ratification of the treaty, which provides for the establishment the of the ICC, and had asked the Senate for its concurrence. “Ratification of the Rome Statute enhances Philippine commitment to human rights and is our contribution to an effective international criminal justice system,” Ochoa said. “It complements Republic Act No. 9851, which enables our country on its own to prosecute international crimes and strengthens human rights’ enforcement in our country,” he added. Republic Act No. 9851, or the Philippine Act on Crimes Against International Humanitarian Law, Genocide and Other Crimes Against Humanity, was signed into law in December 2009. It is said to be the country’s version of the International Humanitarian Law. According to Ochoa, the ICC is the first permanent institution having power to exercise jurisdiction over persons for the most serious crimes of international concerns such as the crime of genocide, crimes against humanity, war crimes and crimes of aggression, and is seen to help end impunity for the perpetrators of these crimes. “It adopts the principle of complementarity that recognizes a State’s right to exercise jurisdiction over these crimes. Meaning, the ICC will only act if such State is unable or unwilling to carry out the investigation and prosecution of the crime,” Ochoa explained. The Rome Statute adheres to the general principles of criminal law and exclusion of jurisdiction over persons under 18 years old, he added. In a meeting convened by the Presidential Human Rights Commission in September last year, the Departments of Justice (DOJ), Foreign Affairs (DFA) and National Defense (DND) agreed to recommend the ratification of the Rome Statute by the President and subsequently transmit it to the Senate for concurrence. The DFA has recommended the timely transmittal of the Rome Statute to the Senate in view of the visit of ICC President Sang-Hyun Song from March 7 to 8 in the country. The Philippines is one of the countries that drafted the 1998 treaty. Former Acting Permanent Representative to the U.N. Enrique Manalo signed it in December 2000. CALBAYOG CITY, Samar – After his first oral declaration before the media of his intention to fight against Samar incumbent governor Sharee Ann Tan in a recall election, Calbayog City Mayor Reynaldo Uy revealed the possibility of holding it either August or September this year. His pronouncement took place during fellowship night of the Philippine Councilor’s League Samar Chapter on Saturday at Ciriaco Hotel, Calbayog City. Said occasion was also a welcome party for Alma Moreno-Salic, who was lobbying for support from Samar legislators in the forthcoming March 11, 2011 PCL national officers’ elections wherein she’s running for president. “Religion is the opium of the people while elections are the opium of the politicians. 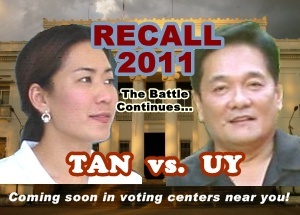 Posibleng magkaroon ng recall election between August and September for governor and vice governor”, bared Uy. Misgovernance and anomalous transactions are the compelling reasons why he opted to run for a higher post despite the able performance of the city in fulfilling its basic social services to the people. These grounds have been cited in a petition for recall election filed before the COMELEC. Be it noted that Uy pursued his Tri-District Programs by stressing his priority projects upon assumption to office. It includes building Calbayog City Hospital (health), Aguit-itan Development Project (housing), Hibatang River Cruise (eco-tourism) and the like. According to him, he had been in politics for 25 years serving his constituents to the best of his ability not because of fame and fortune but it runs in his blood as a politician to serve… and serve well. Admitting Tan’s (mother and siblings tandem) manipulation in the second district, he’s confident that the “ruling majority” at the Sangguniang Panlalawigan is an affirmative indication for beating his opponents in the race. On the other hand, he favored the move for charter change by amending specific provision on term limits of elective officials as it will be advantageous to performing politicians. According to him, three years is not enough to accomplish the programs and projects of a local chief executive for his constituency. The Ecumenical Voice for Peace and Human Rights in the Philippines (Ecumenical Voice), an ecumenical delegation of Philippine human rights organizations and advocates for the defense and promotion of human rights in the country, will again send a delegation to the 16th Session of the UN Human Rights Council (UNHRC) in Geneva, to present the continuing human rights violations in the Philippines and to prepare for the Universal Periodic Review of the Philippines on 2012. The Ecumenical Voice delegation will engage the UNHRC about continuing human rights violations under the Aquino administration, in its first nine months in office, and gather support from the international human rights community to act on the continuing impunity and rights violations in the country. The Ecumenical Voice delegation, which will be in Geneva from March 5 to 15, 2011, is composed of: Bishop Felixberto Calang of the Philippine Independent Church (Iglesia Filipina Independiente or IFI) and the Initiatives for Peace in Mindanao; Marie Hilao-Enriquez of KARAPATAN, Cristina Palabay of Tanggol Bayi (Defend Women-Association of Women Human Rights Defenders); Atty. Rey Cortez of the National Union of People's Lawyers; Girlie Padilla of the Ecumenical Movement for Justice and Peace; and Rhonda Ramiro of the San Francisco Committee on Human Rights in the Philippines. One of the Morong 43 health workers illegally arrested and detained in February last year, Dr. Merry Mia Clamor, will also join the delegation to file a complaint to the UN Special Rapporteur on torture. She will also give an oral intervention about her ordeal before the Rights Council. In June last year, her husband Jigs Clamor of Karapatan, also appealed to the Council in its 14th Session. The delegation shall also bring to the attention of the council the continuing spate of extrajudicial killings in the Philippines under the administration of President Benigno Aquino III, specially the killing of botanist Leonard Co and his companions. The human rights alliance Karapatan has documented 40 victims of extrajudicial killings since Aquino took office. Enriquez also added that they will bring the cases of threats and attacks against human rights defenders, internally displaced persons, victims of arbitrary detention to the Council among others. The UNHRC is an inter-governmental body within the UN system made up of 47 States responsible for strengthening the promotion and protection of human rights around the globe. The Council was created by the UN General Assembly on 15 March 2006 with the main purpose of addressing situations of human rights violations and make recommendations on them. MALACAÑANG, Manila – Executive Secretary Paquito N. Ochoa Jr. said on Friday the Presidential Commission on Good Government (PCGG) had remitted a total of P100 million to the Bureau of Treasury under its six-month-old leadership. Citing a report by PCGG Chairman Andres Bautista to President Benigno Aquino III, Ochoa said the amount turned over to the National Treasury was for the account of the Comprehensive Agrarian Reform Program (CARP), which funding, under the law, is sourced from cash and proceeds from recovered ill-gotten wealth amassed by the Marcoses and their cronies. The Executive Secretary noted that the PCGG’s remittance came from the various accounts of the commission that were no longer subject of any pending litigation. “The Commission is now led by a new batch of brilliant lawyers who comprise a young, dynamic and courageous team. Taking cue from this positive development, we are confident that our pursuit of plundered wealth, stashed away everywhere and anywhere in this country and the entire world, can be recovered and be returned to the collective purse of our country,” Ochoa said. “A new day has definitely dawned on the PCGG, and we have seen the signs of a reinvigorated commission which has recaptured the organization’s original vision and energy for good governance,” Ochoa said. “The PCGG’s task as a commission, therefore, has a futuristic value. Then PCGG will be needed more than ever. It shall have proven to everyone that it has not outlived its usefulness,” he added.